Overall the parking situation in Downtown Navasota is fairly stable. While shortages do occur on a regular basis around some areas, overall parking is available, with each zone possessing a parking surplus. Despite the existing surplus, several activities have the potential to drastically alter the parking conditions presently observed in Downtown including redevelopment of existing building sites, leasing of currently vacant buildings and floors, or new construction. The 2004 Navasota Comprehensive Plan recommends redevelopment and an increase in the density for many portions of Downtown but falls short of recommending specific development sites or detailed land use patterns. 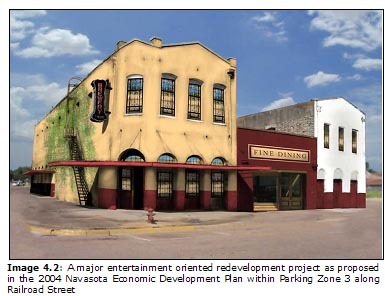 The 2004 Navasota Economic Development Plan also discusses development within Downtown by proposing several potential development sites, but does not give enough specifics about these projects to permit detailed parking planning. In lieu of specific recommendations from these plans, this study will assume a hypothetical redevelopment pattern will occur in Downtown. This hypothetical pattern will mirror the current development conditions. Which is to say, in planning for future parking needs, vacant or storage floor space within structures will be expected to develop in the same land use proportions that are currently seen in the rest of Downtown (see Map 1.1, Page 5). Parking demand will be assumed to remain proportional to existing levels. Vacant land will be excluded from this hypothetical analysis but will be discussed later as relevant. With these assumptions it is important to recognize that redevelopment uncharacteristic to existing Downtown conditions may have unexpected results in terms of parking demand. For example, a structure used for antique sales would have a significantly lower parking demand than if the same structure were developed as a restaurant or nightclub. 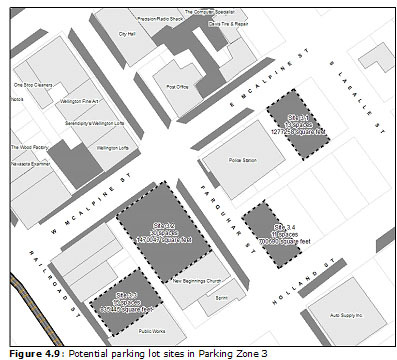 Parking Zone 1 has the least development potential of all five zones. The only completely vacant structure is a building historically used as a gas station which, given the existing building size, has ample room for on-site parking (see Image 4.1). Consequently, development of the structure is only expected to add an additional two parking spaces to current demand if used at typical Downtown land use levels. 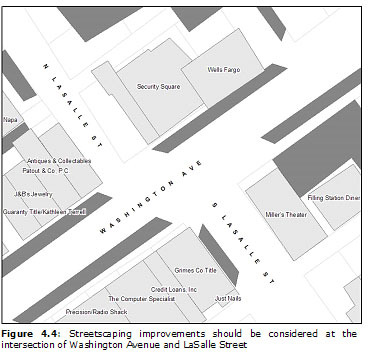 Even then, the zone is expected to have a surplus of 64 spaces (see Map 4.1, Page 51). Parking Zone 2 has a surplus of 45 parking spaces at present. Only one structure has vacant first-floor space available for development, however, other structures have one or two upper floors with such potential. Full build out of this zone is expected to add 17 spaces to its total demand, reducing the surplus to 28 spaces (see Map 4.1, Page 51). 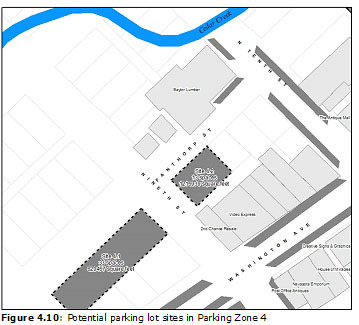 Parking Zone 3 contains several structures with vacant floors or are completely vacant including several projects proposed in the Economic Development Plan (see Image 4.2). Development of these and other vacant structures will add about 53 spaces to the zone’s existing demand, reducing the surplus from 99 spaces to 46. Zone 3 also has several large groups of undeveloped parcels which may dramatically alter parking patterns and levels as development occurs (see Map 4.1, Page 51). Parking Zone 4 is occupied by several buildings which are completely vacant or have upper floors partially occupied by retail storage. The lack of off-street parking lots within the zone may have a larger than normal impact on the current 34 space surplus. Redevelopment is expected to add 9 spaces to the zone’s current peak demand and reduce the surplus to 25 spaces (see Map 4.1). Several structures within the zone also contain basements. Development predictions do not take this space into consideration though basements could be used for commercial purposes eventually. Parking Zone 5 has a current surplus of 32 spaces. This zone has experienced the most recent redevelopment activity with the addition of the Navasota Emporium and the ongoing renovation of a neighboring two-story structure. The zone also contains several multistory structures which are vacant as well as some contiguous unimproved parcels. With such potential for redevelopment, the zone is expected to surpass its current capacity and experience a zone-wide shortage. This redevelopment is projected to add 48 spaces to the zone’s demand creating a deficit of 16 spaces (see Map 4.1). Under the scenarios presented here, all but one of the parking zones are expected to retain at least a small zone-wide parking surplus. However, to reiterate the previous warning, the scenario assumes only that vacant structures and floors will be redeveloped, and that such redevelopment will be of similar types and ratios to businesses presently within Downtown. With an effective redevelopment strategy, business owners within Downtown may see an increase in current customer levels. It is also possible that a redevelopment strategy may bring more diverse and intense land uses to Downtown such as those proposed in the 2004 Navasota Economic Development Plan. Redevelopment also typically attempts to attract more residential influx into downtown buildings. Combined, redevelopment and revitalization of new and existing businesses may drastically impact the current parking demand rates. While increased demand is a desirable economic outcome, for both business owners and tax revenues, it may significantly reduce or eliminate the parking surpluses currently projected within Downtown Navasota. It is also important to consider that while each parking zone was created with the idea that pedestrians could move freely within the zone, in reality some barriers to pedestrian movement still exist. Such barriers may make existing overall surpluses irrelevant, as in the case of the intimidating alleyways leading from parking lots to commercial entrances within Zone 2. Whether necessitated by redevelopment or localized shortages, more parking within Downtown is desirable. Two options are available to facilitate this goal, which include physically constructing more parking spaces or altering the management of existing spaces to increase their efficiency, also referred to as "effective supply." In Navasota it is recommended that City and business leaders engage in both strategies. In short, effective supply is the number of parked vehicles an area can support during a given time frame. For example, (Example 1) a 10 space parking group could have various effective supplies depending on the turnover observed in the lot. If this parking group served mainly retail customers remaining parked an average of 45 minutes each, it would have an effective supply of 100 vehicles during a ten-hour workday (see Table 4.1). Taking the same example, and changing the use type to serve mainly employees which might stay parked an average of 3 hours and 45 minutes, lowers the effective supply to just 25 vehicles throughout the same workday (Example 2). This example also accounts for the lag time needed for one vehicle to vacate a space and another vehicle to pull into it, usually fifteen minutes. One strategy utilized in order to increase the parking supply in Downtown Navasota should be to convert the on-street parking from a mix of long and short term parking to exclusively short-term parking. Relocating the long-term, mostly employee parking to the relatively empty parking lots will drastically increase the effective supply for the whole of Downtown. This change is possible because the dominant parking format (on-street) is being effectively increased at the expense of the less common parking format (off-street). To further illustrate this point the effective supply of Downtown Navasota has been calculated along with a hypothetical scenario for comparison. In Table 4.2, each parking zone has its average turnover listed in the "Turnover" column. The "Total Capacity" column is the total number of parking spaces available in each zone. Finally, the "Effective Supply" column shows the number of vehicles each parking zone can accommodate given existing turnover conditions. The example assumes each space would require 15 minutes between occupants. Therefore, Downtown is capable of parking just over 3,000 vehicles during a nine-hour workday (8:00 a.m. to 5:00 p.m.). Also, Table 4.2 is a simplified breakdown of the effective supply for each parking zone within Downtown. The total effective supply discussed above is calculated per parking group, while the numbers in this table are based instead upon parking zones for simplification. Section 7, Page 85 of the Methodology Section includes a complete table illustrating the effective supply of each parking group. The hypothetical scenario involves relocating many of the employees that currently park in on-street parking to off-street parking lots. Therefore decreasing the time required to turnover a parking space in on-street parking while increasing turnover time in parking lots. This scenario is extremely simplified and will assume a given drop in turnover time for on-street parking will directly correspond with an increase of the same magnitude in off-street parking. The scenario attempts to increase the effective supply of parking by 500 spaces, from 3,000 to 3,500 vehicles per day. Table 4.3 is a simplified breakdown of the scenario similar to Table 4.2. Again, a complete table is available in the Methodology Section (Section 7, Page 85). All that is needed to achieve this increase in the effective supply given Downtown's current conditions is lowering the on-street parking turnover time by 23 minutes. This change would cause a corresponding 23 minute increase for off-street parking lots. It may not be realistic to expect that all parking groups could have their turnover times lowered by a full 23 minutes, therefore this example assumes that no parking group could be lowered to a turnover of less than the current minimum turnover time found in Downtown (22 minutes plus a 15 minute lag time). Still, even modest decreases in the turnover time for on-street parking can result in significant increases in overall parking capacity. For example, a decrease of just 15 minutes yields just over 300 parking spaces worth of effective supply. A drop of 5 minutes yields an additional 95 parking spaces. Most importantly this increased capacity will be very evident in the areas currently experiencing the worst parking shortages. These measures can provide an increased capacity for on-street parking groups serving commercial and service institutions along Farquhar Street, McAlpine Street, and Washington Avenue. While compelling employees and individuals engaged in long-term parking to move from on-street parking has the potential to create a significantly larger effective parking supply, the implementation of this goal faces several obstacles. The first of these obstacles is a lack of off-street parking lots within some areas of Downtown. Parking Zones 1 and 2 are somewhat unique in that they already have large off-street parking lots available. Similar parking locations should be constructed within Parking Zones 3, 4, and 5 which would provide employees in these zones safe and quick access to long-term parking. Where parking lots already exist, efforts should be made to improve connections between employment locations and existing parking lots. This may involve improvements in streetscaping, landscaping, lighting, and in some cases building façades. Improvements to the pedestrian feel of sidewalks as well as traffic calming measures will also encourage movement between zones. A district-wide parking policy should be adopted regarding employee parking. This policy could be negotiated as a component of a future Downtown Master Plan, as a standalone policy statement or an informal agreement between City and business representatives. Regardless, the policy should be the result of extensive input and negotiation between both City and business interests. Implementation of the policy will likely require self policing of employees by business owners, as well as enforcement by the City. Therefore stakeholder buy in is particularly important in both planning and implementation of any parking policy. Current parking restrictions and time limiting signage should also be reviewed as a part of this policy. Additionally, this policy should include but not be limited to a review of existing signage location, time limits, and design. The policy could also be used to discuss how the burden of creating new parking should be shared, if devices such as parking meters should be employed, and what enforcement measures regarding long-term parking are appropriate. Wayfinding techniques, including directional signs, may also be a problem for visitors and customers. Signage clearly indicating public parking is currently somewhat limited within Downtown. Where signs do exist they are frequently difficult to read and lack continuity in design. Regardless of the specifics included in the new parking policy, some construction of new parking and reconfiguration of existing parking is recommended to make employees as well as customers more comfortable with using off-street parking. Prior to discussing specific recommendations a general explanation of the streetscaping terms which will be used should be presented. 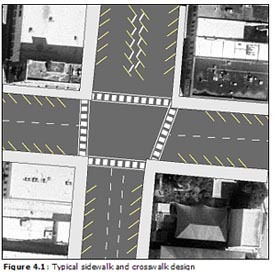 Figure 4.1 is a hypothetical streetscape design which utilizes many of the concepts that will be discussed. 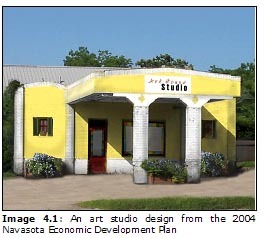 This Figure represents a streetscape not unlike those currently found in Downtown Navasota. Sidewalks are relatively straight, striped parking is provided with blank areas at intersections, and crosswalks are simply painted white. This design presents several problems for the pedestrian. Because parking is usually not striped all the way to the end of the street, drivers frequently use the un-striped areas as de facto right-turn lanes. Additionally, crosswalks marked with white paint frequently fade and do not represent a "solid" marker. 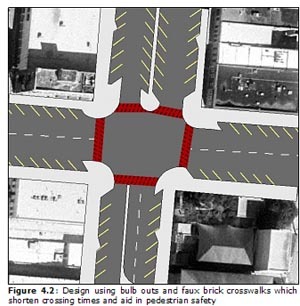 Figure 4.2 represents the addition of two major urban streetscaping elements, the bulb out and faux brick paved crosswalks. Bulb outs are simply extensions of the sidewalk at intersections, into what is normally considered the street. Bulb outs are frequently extended to the end of stripes marking on-street parking spaces. They are often designed in a way which permits drainage to flow along the original sidewalk edge. There are several purposes of bulb outs in urban streetscaping. Much like landscape islands in parking lots, bulb outs serve to define the parking row. This design provides an increased level of safety for parked vehicles as well as pedestrians near the corner of intersections. Bulb outs also shorten the time necessary for pedestrians to cross a road by extending the sidewalk. In this example the average crossing distance for traditional straight sidewalks was 81 feet. At the generally accepted walking speed of 3.5 feet per second, an average crossing would require 23 seconds. With the bulb out design, the average crossing distance was reduced to 57.5 feet or approximately 16 seconds. 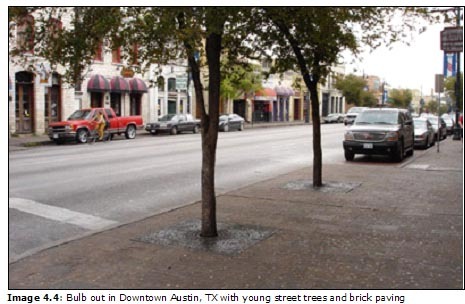 Bulb outs can also provide a location for other streetscaping elements such as street lighting, street trees, and/or benches. It should also be explained that the installation of bulb outs need not result in a loss of on-street parking. In the case of Navasota, on-street parking is not striped close to intersections which is where bulb outs would most likely be employed. 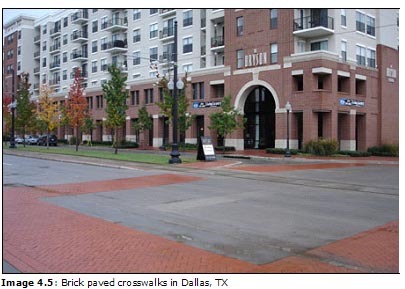 The other streetscaping element included in Figure 4.2 (Page 56) is faux brick paved crosswalks. The use of brick at crosswalks is included for several reasons. In terms of pedestrian safety, any change in color and texture is commonly believed to serve as an effective traffic calming device. Brick pavers are considered much more substantial by most pedestrians and are significantly less likely to succumb to aging and fading as compared to simple painted stripes. Brick pavers also find use as a strictly aesthetic improvement to urban streetscapes. 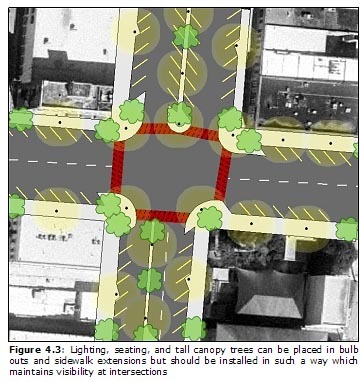 Figure 4.3 demonstrates the use of bulb outs and sidewalk extensions for placement of other streetscapeing elements. Historic themed street lights, benches, trash receptacles, and even street trees may be located in the bulb outs to the benefit of both pedestrians and drivers. Trees with a sufficiently high canopy are necessary for a well shaded sidewalk and adequate visibility triangle below the lowest branches. Parking Zone 1 draws many benefits from the two large parking lots located there. While parking generated by the diner and movie theater can be high at times, the slightly skewed peak between these two uses and occasional patronage of both establishments in one trip by customers tends to limit parking problems. Future development is also expected to be limited as most lease spaces are currently occupied (see Map 4.1, Page 51). Despite this, streetscaping and traffic calming efforts may facilitate movement within the zone, as well as pedestrian traffic to and from Parking Zones 2 and 3, allowing surpluses in Parking Zone 1 to be of benefit elsewhere. 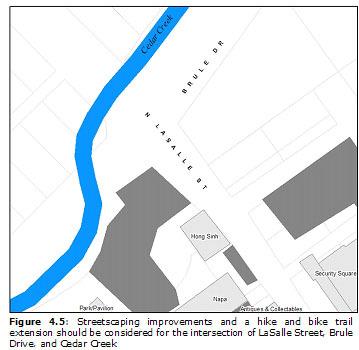 The intersection of Washington Avenue and LaSalle Street would be the most logical location for these improvements (see Figure 4.4). The use of bulb outs and faux brick pavers at crosswalks may significantly reduce the time and danger involved in crossing the intersection that pedestrians currently face. The intersection already suffers from an unusual alignment for traffic traveling on LaSalle Street which may preclude the introduction of some of these techniques, however, any improvement would be beneficial. Another location within Parking Zone 1 which presents a pedestrian barrier is the intersection of Brule Drive and LaSalle Street (see Figure 4.5). 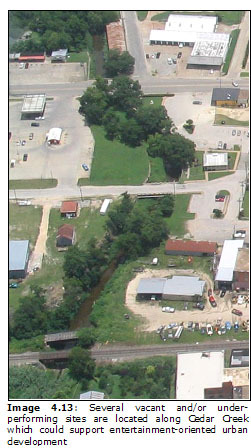 This location is also where Cedar Creek enters Downtown as well as the termination of the existing hike and bike trail. Redevelopment efforts centering around improvements to the Creek and extension of this trail would depend upon better access for pedestrians crossing LaSalle Street at this point. Possible solutions which should be considered include faux brick pavers, bulb outs, wider sidewalks, and/or a pedestrian underpass. Extension of the trail would provide not only access between parking Zone 1 and 2, but also improve pedestrian access into Downtown from other neighborhoods and population centers within Navasota. Improvements to this intersection could also form the foundation of recommended Northern gateway enhancements. As with all the recommendations made within this section, specifics regarding design and implementation should be made after extensive public involvement and planning. 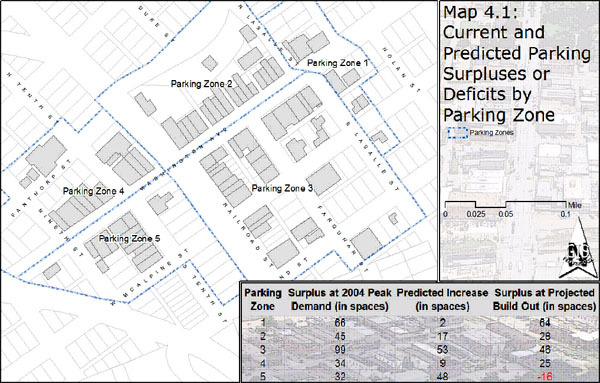 Parking Zone 2 is currently experiencing a surplus of 45 spaces, and is projected to retain a surplus of nearly 30 spaces even when fully built-out (see Map 4.1). Regardless, the zone faces many challenges in terms of providing better access to existing parking lots. The current and projected surpluses assume that parking in these lots will be fully utilized by customers and employees. The most frequently mentioned resistance to requiring employees to park in rear-parking lots is the issue of unsafe alleys. 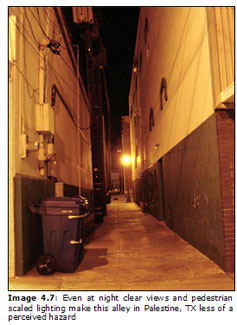 To be used, an alley must appear safe in both the early morning and late evening hours. One of the best ways to accomplish this is the presence of people, a concept referred to as "eyes on the street" or "defensible spaces." This goal might be accomplished through façade renovations to existing buildings to install office windows and doors. 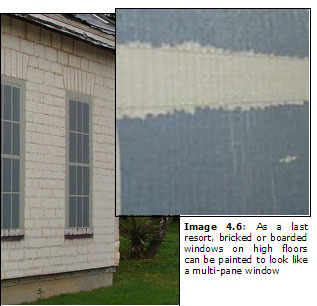 Although only lighted windows will improve conditions at night, even painting a "window" over brick can be a temporary improvement for windows not directly assessable to pedestrians (see Image 4.6). In situations such as second floor windows that have been bricked over this technique might be most useful. Installing opaque or reflective glass windows over the existing bricks is another option. 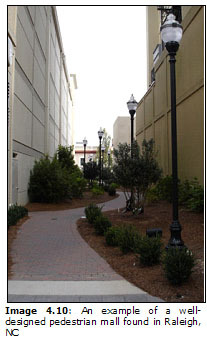 Abundant lighting and clear views are also necessary for pedestrian friendly alleyways (see Image 4.7). Landscaping can also play an important role in improving the alley’s appearance, but should be installed in a way which avoids creating potential hiding places and dark spots. A clear view through the alley should be maintained from both Washington Avenue and the rear parking lots. The issue of a proper mix between vehicular and pedestrian traffic is also central to the design of a well used alley. Two-way vehicular traffic, one-way vehicular traffic, or closing the alley to all but pedestrians are several options. 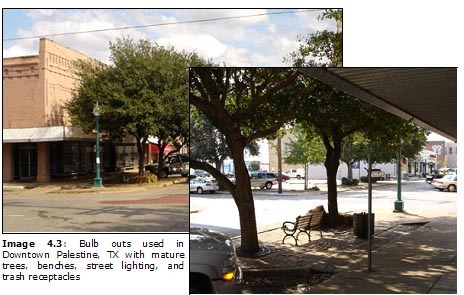 Alley 1 (see Figure 4.6) is the best example of a pedestrian friendly alley in Downtown Navasota. 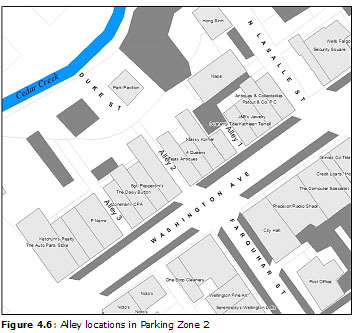 (see Image 4.8) In this case three entrances to the alley are provided, with limited vehicular traffic permitted. Large windows in the buildings containing both the law offices and auto-parts store give pedestrians the feeling that they are not alone. Rear entrances to these establishments also permit employees parking in the alley quick access to and from their vehicles, but also contribute to the pedestrian scale. 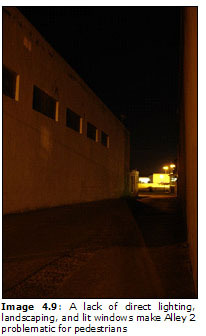 All parts of the alley are well illuminated with lighting located within the alley as well as on adjacent buildings. Landscaping and attractive hardscapeing, such as decorative brick and sidewalks, are also provided in appropriate locations. Alley 2, which makes up the final block of Duke Street, intersects Washington Avenue just to the west of Tejas Antiques and across from Farquhar Street (see Figure 4.6). This access point is significantly less pedestrian friendly. Two-way vehicular traffic within the long and narrow space creates an intimidating situation for pedestrians, with no sidewalks or striping provided to define a pedestrian zone. Additionally, lighting and landscaping are completely absent. Street lighting from Washington Avenue illuminates the southern entrance to the alley, however, the 45 yard span remains very dark during the evenings and early mornings. Further compounding the situation, many windows on the surrounding buildings have been bricked closed thus contributing to the sense of isolation felt by pedestrians (see Image 4.9). Alley 3, just east of the P. Nemir clothing store shares many of the same problems with Alley 2. However, it benefits from a shorter length and the presences of a stairway leading to a second-floor loft (see Figure 4.6). Two-way traffic is permitted despite the relatively narrow width of the alley. Light into the alley is also very limited, creating not only an extremely intimidating experience for pedestrians using the alley, but extending the perceived safety problem onto this portion of Washington Avenue’s sidewalk. Vehicular circulation in alleys 2 and 3 should immediately be addressed. The Navasota Comprehensive Plan recommends that these alleys be reconfigured as one-way streets. This study goes further in recommending that steps be taken toward making the alleys more pedestrian friendly as well. 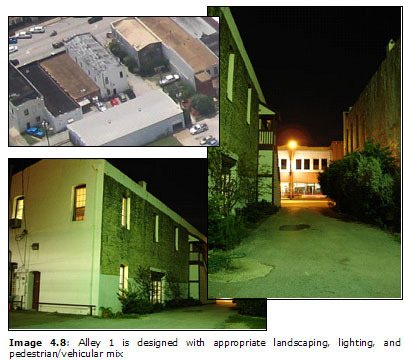 At a minimum, lighting within the alleys should be installed. It is also recommended that where alley width permits a raised sidewalk with landscaping be considered. A more radical solution might involve closing one of the alleys to vehicular traffic altogether and creating a fully landscaped and appointed pedestrian mall (see Image 4.10). Such a design could strictly serve as a walkway, or incorporate benches and tables to attract outdoor lunch and dinner use. Lighting and design would be critical and should be the product of thorough planning and stakeholder involvement. Attention should also be given to improving aesthetics and safety of the rear-parking lots themselves (see Figure 4.7). 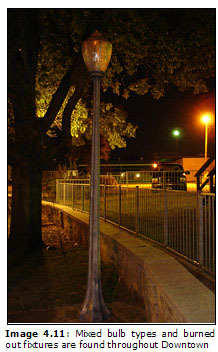 Historic style street lighting is used along Cedar Creek and within parts of the parking lots. The style contributes greatly to the pedestrian feel, however, some locations within the parking lot do not receive an adequate level of lighting. It may also be useful for the City to consider replacing high-pressure sodium bulbs which produce a yellow light with a more aesthetically pleasing white light (Metal Halide or Mercury Vapor). Some urban designers maintain that white lighting perpetuates a sense of safety. Maintenance is also important, throughout fieldwork several lights appeared to be burned out (see Image 4.11). Mature trees along the Creek front give the northern edge of the parking lot an attractive park feel, however, landscaping closer to the buildings is limited or nonexistent (see Image 4.12). Extension of the paved hike and bike trail could further enhance usability of the area. Another option requiring more redevelopment is the addition of commercial entrances in the rear and sides of some buildings. In some cases, particularly for buildings with backs facing Cedar Creek, renovation may permit entirely separate businesses to exist facing the Creek and park with windows or doors in the alleys as well. 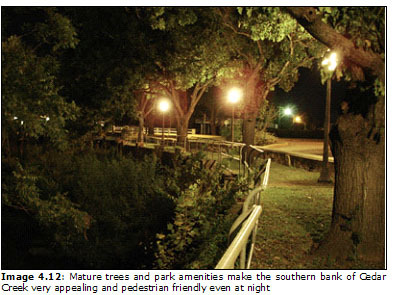 The desire to capture Cedar Creek as a "Riverwalk" style attraction was mentioned by multiple respondents during public participation for the Comprehensive Plan. Entertainment, restaurant, and nightclub activities benefit greatly from attractive water features such as creeks or rivers. Underperforming parcels on the northern bank of Cedar Creek not currently considered within Downtown may also be good candidates for urban style development oriented both physically and thematically to the Creek (see Image 4.13). The five parcels in the southern end of the Brookshire Brothers parking lot are a potential starting point for this style of development. Shared parking between the grocery store and entertainment oriented businesses fronting along the Creek would likely work out well due to staggered peak operating hours. If successful, several other groups of parcels on both banks of the Creek east of LaSalle Street and west of Duke Street might also succeed in this type of development. 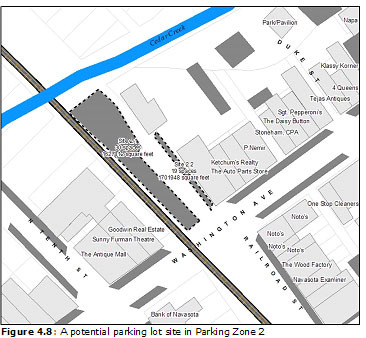 Another option intended to increase parking supply within the zone is to construct a new off-street parking lot which takes direct access from Washington Avenue (see Figure 4.8). The right-of-way between Goodwin Real Estate and The Auto Parts Store north of Washington Avenue is currently used for storage of vehicles being serviced nearby. The lot is not currently paved and lacks any screening between the railroad, Washington Avenue, and the existing vehicle storage. This site was identified by many citizens during public involvement for the 2004 Navasota Comprehensive Plan as a high-profile eyesore. If developed in whole or in part as a public parking lot, the area currently used for automotive storage could provide many new parking spaces. As shown in Figure 4.8, the 0.39 acres of land could allow for a combined 49 new on and off-street parking spaces. This estimate is based on the current design standards of existing Downtown parking lots, while also allowing for increased streetscaping and landscaping elements. 1.6 million square feet of Downtown building space is within 300 feet of this site. If funding for the full lot is not available at one time, construction could be phased in over several years starting with the section closest to Washington Avenue. Streetscaping improvements and internal landscaping could provide space for both public parking and some continued use by the automotive service facility. On-street parking similar to the parking along Railroad Street could also be installed to give continuity in urban design. In addition, extending sidewalks through the parking lot along Washington Avenue would provide improved pedestrian linkages between parking Zones 2 and 4. Cooperation and input from the railroad would be necessary, however, City maintenance of the currently un kept wild plants and installation of landscaped buffers between the railroad tracks and existing parking would seem advantageous to all involved parties. More controlled storm water drainage movement to the Creek could also be accomplished through the site. Wayfinding signage is also problematic within Parking Zone 2. Two signs are used to direct motorist from LaSalle Street and Washington Avenue to public parking lots. Neither sign is lit, and both suffer from limited visibility (see Image 4.14). 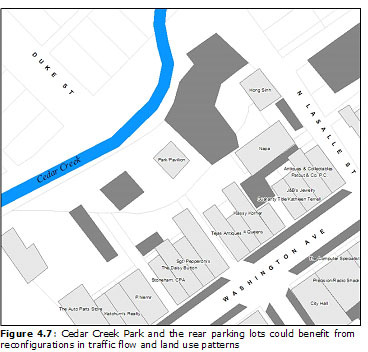 Usage information about Cedar Creek as well as landscaping confuse and obscure visibility of the public parking sign along LaSalle Street. Aging paint and a lack of lighting make the wall sign along Washington Avenue difficult to read at night. 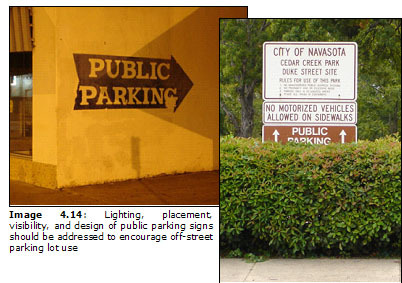 Both signs suffer from a lack of consistent design with parking signage in Downtown Navasota as well as with signage found in other cities. Standard signage should drastically improve usability at these locations. On-street parking within both Parking Zones 2 and 3 along Washington Avenue is some of the most well used parking within Downtown. Streetscape design should be utilized to not only retain this parking but make it an even more efficient and aesthetic asset. During fieldwork tracking employee parking, some employees regularly parking in Zone 3 were briefly observed parked in Zones 2, 4, or 5 during lunch. This behavior indicates that in many cases Washington Avenue and/or the railroad tracks at Railroad Street are significant pedestrian barriers. The streetscaping improvements intended to improve pedestrian use mentioned for Parking Zone 1 could also be utilized at the intersection of Railroad Street and Washington Avenue. Coordination and planning of these improvements with the potential off-street parking lot mentioned for Parking Zone 2 could be conducted simultaneously, therefore providing for better pedestrian circulation and usage of both new and existing off-street parking lots in Zones 2 and 3. While streetscaping upgrades along Washington Avenue will improve access between Parking Zone 3 and neighboring parking zones, parking shortages within the zone must also be addressed. With on-street parking averaging over 60% employee with a greater than 70 minute turnover, employee parking is having a pronounced impact within the zone. The most likely cause is a lack of off-street parking lots within the zone for employee use. While overall parking shortages and employee parking locations are problems in the zone, the area is benefited by several potential locations for parking lots (see Figure 4.9). Locations identified are potential tracks of land based on current land use and have been identified by Butler Planning Services not by any representative of the City of Navasota. The four identified tracks are all unimproved land within reasonable proximities to significant downtown development. Table 4.4 summarizes the strengths and weaknesses of each option. The number of potential spaces within each site is derived using the average density of parking spaces currently built within Downtown. Therefore, this number may be higher or lower than the actual number of spaces possible given specific site conditions and space utilized for parking lot amenities such as landscaping. Building square footage for each parking lot is an estimate of the total square footage of Downtown buildings found within a 300 foot buffer of the parking lot site. Site 3.2 (see Figure 4.9) has the highest number of potential parking spaces of the four alternatives within Parking Zone 3 at 30, while it also serves the largest amount of square footage with just under 1.5 million (see Table 4.4). In terms of location this site is centrally located within Parking Zone 3, and has the potential to help spur redevelopment in several adjoining properties and buildings. All parcels making up the site are currently privately held by the same owner. Site 3.1 has room to accommodate up to 13 spaces and serves nearly 1.3 million square feet of building space. In terms of location Site 3.1 is not as centrally located as Site 3.2, however, its close proximity to the Police Station and Postal Office could bring benefits in terms of attracting employee parking. Its location along LaSalle Street also creates an opportunity to utilize enhanced streetscaping and park amenities within a potential parking lot. The site also has another major advantage over the other three options because it is currently owned by the City. A City staff/citizen task force is actively exploring the possibility of creating a parking lot and small city park on the site. Site 3.3 should support 15 spaces and serve just over 800,000 square feet of Downtown building space. Its location along Railroad Street could provide parking for adjoining structures; however, many employees and customers may resist parking here and walking to other establishments on Farquhar Street or Washington Avenue due to the distance. Also problematic, ownership is privately held among multiple individuals. Site 3.4 would serve the smallest quantity of existing square footage at just over 700,000 and provide about 11 parking spaces. The area identified is privately owned by a single individual. Other adjoining lots could also be developed as parking with similar service statistics. Another option is to construct more parking within the block containing City Hall and the Postal Office. Existing parking could be re-configured and some under performing sites could be redeveloped either as parking or revitalized commercial structures. Given the advantages and limitations presented by each option, it is recommended that the City continue work through the established task force to build a parking lot at Site 3.1 (see Figure 4.9). The potential amenities suggested by this task force including a clock tower and public plaza would also fit well with the goals of the 2004 Navasota Comprehensive Plan and this study. Namely, the establishment of a southern gateway and the provision of parking designed in a matter compatible with the desired urban form. Such design should take precedence over maximizing the total parking on the site. It is also recommended that the City explore possible development options for a future parking lot located on Site 3.2 with the current owner. Development incentives, public/private partnerships, or outright City purchase may be beneficial to all parties. Regardless of the methods, development of all or part of this site as a parking lot could be used to support new tax generating development within this part of Downtown. Design of any parking lot components should be undertaken with attention to preserving the urban feel of Downtown including sidewalks along the street with appropriate landscaping and curb cuts if parking directly abuts the right-of-way (see Image 4.15). Site 3.3 will likely produce the most benefit to Downtown as a part of an overall redevelopment effort along Railroad Street as future building sites. Site 3.4 may also be a worthwhile project, but should be evaluated as redevelopment occurs or as an alternative if Site 3.2 is not developed to accommodate parking. With construction of off-street parking lots, pedestrian circulation within the zone should also be facilitated. This work includes streetscaping improvements as well as addressing urban infrastructure concerns. Capital Improvements Programming (CIP) should be utilized to coordinate the installation of upgraded streetscaping with needed infrastructure improvements. For example, drainage concerns were expressed by Downtown business owners along McAlpine and Farquhar Streets. Construction or repair of storm sewers can be coordinated with the installation of sidewalks, pedestrian-scaled street lighting, landscaping, etc. The installation of sidewalks should also be coordinated with site development either through subdivision regulations, City participation, or site plan requirements. The possibility of re-configuring some existing parallel parking should also be explored within this zone and if permitted by street width, converted to angled head-in parking along with other streetscape improvements. Parking Zone 4 benefits from a diverse group of land uses. Many of the businesses generate peak parking demands on different days of the week, therefore resulting in few obvious parking shortages. One limitation of parking within the zone is a lack of off-street parking lots. While this may not be a problem in the short run, if development of vacant tracks within the zone, as well as redevelopment of existing buildings occurs with higher intensity uses, parking will become a problem quickly. This is particularly likely to happen if larger numbers of employees are located within the zone. Five contiguous unimproved parcels are located at the western extent of the zone with frontage along Washington Avenue. Trailers and vehicles with "for sale" signs are occasionally parked on these lots. If redevelopment of Downtown progresses to a point where land values justify development on these lots, one option would be for the owner to build structures along Washington Avenue and include off-street parking in the rear. The scenario is illustrated in Figure 4.10, Site 4.1. If the site were developed as shown, approximately 33 parking spaces could be included in the rear parking lot, with about 630,000 square feet of building space per floor along Washington Avenue. Under this scenario the on-street parking on Washington Avenue at this location would also be available. 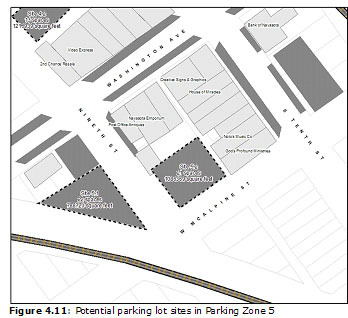 Off-street parking could also be developed behind the existing buildings along Washington Avenue at the corner of Ninth and Fanthorp Streets, Site 4.2 (see Figure 4.10). Depending on configuration, a parking lot at the site could accommodate 13 parking spaces while serving 1.2 million square feet of existing Downtown buildings. Several back lots in this block are currently used for outside storage and may be potential locations for either parking or new buildings. Another possible location for more parking is existing streets not currently striped for parking. Fanthorp and Ninth streets are currently narrowly paved with some noticeable pavement problems. Within the zone these and other streets suffer from poorly suited or nonexistent sidewalks, curb and gutters, and street lighting. Streetscaping improvements on these streets could provide many new on-street parking spaces as well as significantly increase the redevelopment potential of neighboring land parcels. Public Works investment here would also serve to improve the aesthetic appeal of western Downtown and lay the groundwork for a western gateway. CIP should be used here as well to coordinate upgrades of each streetscape and utility components. As with Parking Zones 2 and 3, Parking Zones 4 and 5 are separated by Washington Avenue. The installation of the previously described streetscaping improvements including bulb outs may be desirable to improve productivity between structures north and south of Washington Avenue. 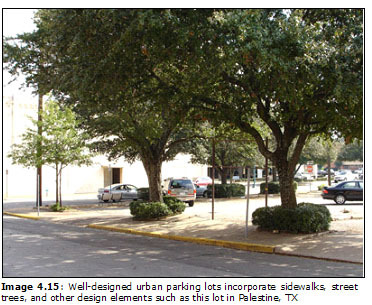 Public involvement for the Urban Image portion of the 2004 Navasota Comprehensive Plan indicated an interest in the installation of a landscaped median at this location similar to the one found at the eastern entrance of Downtown (see Image 4.16). Such construction would add to other streetscape and gateway improvements. Parking Zone 5 is currently projected to experience a 16 space deficit at full build-out. Within the zone itself there is a deficiency of high quality urban streets, similar to Zone 4. McApline and Ninth Streets lack sidewalks and curb-and-gutter facilities. The street surface is also narrow and in disrepair in certain areas. As with Parking Zone 2, CIP coordination may permit the installation of streetscaping elements along with other needed infrastructure upgrades. Striped on-street parking should also be installed wherever possible to help alleviate projected parking deficits. As for off-street parking within the zone, several possibilities exist. Site 5.1 is currently unimproved land fronting Ninth Street in the east, and the railroad right-of-way in the west (see Figure 4.11, Image 4.16). A well used but physically distressed building is located to the north of this site. 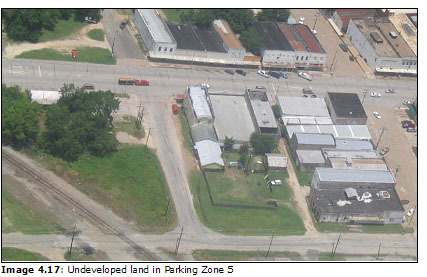 Redevelopment or revitalization of these properties including the existing off-street parking lot may further necessitate development of Site 5.1 as parking. As proposed in Figure 4.11 a parking lot on this site could accommodate 22 additional spaces while serving just under 800,000 square feet of existing building space (see Table 4.6). Site 5.2 is located in the rear of buildings fronting along Washington Avenue and Tenth Street. The land is currently fenced and used for a variety of purposes, but lacks major construction (see Image 4.17). Recent redevelopment of the structures fronting on Washington Avenue may necessitate the use of this land for employee and customer parking. The property is currently under private ownership by a landowner who also owns some other redeveloped structures. Given high employee parking currently found along Washington Avenue, relocating employees to such a back lot would drastically reduce the parking shortages currently found here (85% occupied at peak). With the installation of off-street parking lots within the zone, care should be taken to avoid the problems found in Parking Zone 2’s alleyways. The pedestrian friendly techniques explained previously including lighting, landscaping, and hardscapeing should be utilized.